In a war-torn country, some young people are not afraid to go soaring from the top of the mountain that overlooks the Shamali plain in Afghanistan. 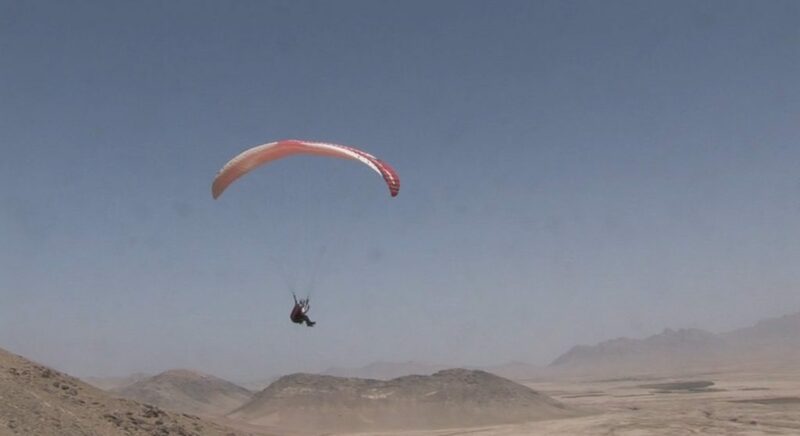 Sam French, a filmmaker who has made many documentaries in this country (including some award winners – see below), met the first Afghan paraglider. Discover the thirst for freedom of these young pilots who fly with a wing left on the spot by a person who had tried to set up an association. Who is volunteering to accompany these new pilots? An Oscar-nominated filmmaker and founding director of the documentary production company Development Pictures, Sam French’s work has appeared on HBO, BBC, CNN, Channel 4 News, Al Jazeera, National Geographic and other broadcast outlets. Sam lived and worked in Afghanistan for five years, and in 2012, he returned to his roots in narrative filmmaking to direct “Buzkashi Boys,” shot entirely on location in Kabul. “Buzkashi Boys” was nominated for an Academy Award in 2013, and was co-produced by the Afghan Film Project, a non-profit NGO that Sam co-founded in 2010 to help train Afghan filmmakers and foster Afghanistan’s film industry. Currently Sam is in postproduction on the documentary film “In-Justice” about two heroic women fighting for their freedom after being imprisoned in Afghanistan for moral crimes. He is slated to direct the film “Hunting Hope,” an action thriller about the ivory trade starring Chinese actor Wang Leehom, as well as the Shanghai based romantic drama “The Red Thread” for DAS Films. He lives in Los Angeles.